Dry Eye Syndrome Is High among Menopausal Women and the Reason May Surprise You, Reports Bio-Logic Aqua Research Founder Sharon Kleyne. Dry eye has become the number one complaint heard by eye doctors in the United States. In a recent interview, eye moisture expert Sharon Kleyne, founder of Bio-Logic Aqua Research, Inc. and host of the Sharon Kleyne Hour Power of Water radio talk show, noted that the incidence of dry eye increases as we age and that women, especially menopausal and post-menopausal women, have a significantly higher dry eye rate than men (Mathers, 2006). One reason for the higher incidence of dry eye in menopausal women, according to Mrs. Kleyne, may be insufficient production of the male hormone androgen. Hormones, Mrs. Kleyne explained, are naturally occurring chemicals in the body that exert a stimulatory effect on living cells, often working through the nervous system. Male hormones (testosterone and androgen) and female hormones (estrogen and prolactin) are present in everyone and only the amount and ratios change with age and gender (Females normally produce more female hormones and males produce more male hormones) (Mathers, 2006). The primary hormones thought to influence or "trigger" dry eye, according to Mrs. Kleyne, are the "male" hormones testosterone and androgen. She adds that there are hormone triggers for both normal tear production, which supplies the tear film and maintains moist, comfortable eyes; and for reflex tearing, which occurs when one cries, is extremely fatigued, or when foreign substances enter the eye (Mathers, 2006). Persistent, long term increases in dry eye symptoms, caused by declining tear production, said Mrs. Kleyne, are associated with increases or decreases in certain triggering hormones. Increased incidence of dry eye is known to correlate with hormone related factors such as age, gender and pregnancy (Mathers, 2006). Animal studies, mostly in rabbits, according to Sharon Kleyne, demonstrate lacrimal gland (tear gland) atrophy (resulting in too little water in the tear film) with the withdrawal of androgen. Estrogen may also play a role because the lacrimal gland has both estrogen and androgen receptors. Prolactin may also play a role, and women with high blood levels of prolactin have decreased tear and tear film production (Mathers, 2006). One interesting aspect of hormone and dry eye interaction, according to Mrs. Kleyne, occurs with “hormone replacement therapy” (HRT) used to alleviate menopause symptoms. Since the incidence of dry eye is higher among menopausal and post-menopausal women than pre-menopausal women, it was theorized that estrogen replacement could help alleviate dry eye. However, a study involving thousands of women found that estrogen did not improve dry eye and that estrogen with progestin actually made dry eye worse (Mathers, 2006). Sharon Kleyne emphasizes that improved eye and tear film health could help reduce the incidence and severity of dry eye no matter what your age or gender. Diet should include dark green leafy vegetables, omega-3 fatty acids and at least eight glasses of water per day. Lifestyle should include plenty of sleep and exercise, and stress reduction. All-natural water replacement therapy to humidify dry eyes has also been proven beneficial. 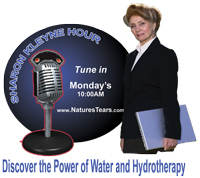 Sharon Kleyne's popular radio talk show, Sharon Kleyne Hour Power of Water, is sponsored by Bio-Logic Aqua Research, whose Nature's Tears® EyeMist® is the only all-natural, all water patented personal hand held humidifying device that soothes dry eye symptoms and supplements natural tear film water. Nature’s Tears® EyeMist® is available at http://www.BioLogicAqua.com, Amazon.com, drugstore.com and selected drugstores nationwide. The product is expected to be available worldwide by the end of 2013. Mathers, W, MD, Tear Film and Treatment of Dry Eye Disease, © 2004 RxSchools.com. Sponsored by Bio-Logic Aqua Research.